The AU Series III Ford Falcon was introduced in October 2001, as a very minor refresh of the 2000 AUII. Falcon- $32,515-$50,690. Fairlane- $50,350-$53,677. LTD- $66,977-$70,165. 237,701 Falcons, 11,906 Fairlanes, and 853 LTDs (all incl. AUI/II/III) were built. AU Falcon replaced in September 2002 by the BA Falcon, whilst the AU Fairlane/LTD was replaced in July 2003 by the BA Fairlane/LTD. AU Series III FTE Ford Falcon range. 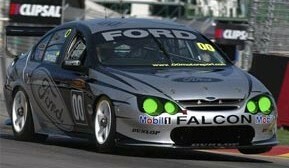 For the 2002 season, instead of having a sole factory Ford team, Ford had sponsored several racing teams in the V8 Supercars. Developed in 2001 (in Gibson Motorsport form), the 00 Motorsport team was the closest thing to a factory Ford team for 2002. The 2002 Drivers included #00 Craig Lowndes, #27 Neil Crompton, and to a lesser degree, #7 Rodney Forbes. Falcon SR - Based on Forté. Rear spoiler (sedan), chrome exhaust tip, 16 inch alloy wheels, cruise control, sports trim fabric, SR decals, sports suspension (wagon), roof racks (wagon). Sports Edition- upgrade on utility. Images from Ford Australia, and FTE unless otherwise specified.